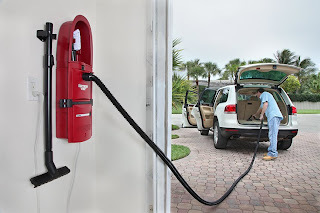 Have you ever been plagued with the duty of cleaning up your garage or car and not have a handy cleaning device? Your problems are solved with a quick 10 minute solution. It's called the GarageVac. 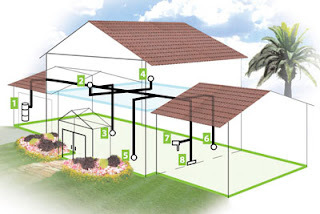 There is no need to install pipes and inlets like you would with a traditional central vacuum system. It is its own stand-alone vacuum system that takes up half the wall space of other systems. Designed with the garage in mind, GarageVac helps you organize your space and gives you all the tools you need to keep it clean. 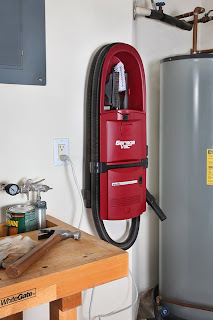 With two installation options, GarageVac is the only central vacuum cleaner in the world that can be mounted onto a 2 x 4 stud wall, or can be hung on the surface of the garage wall. There's no need to be confined to just the garage with this unit. Just take it off the wall when you're heading out in you r RV or cruising on your boat. Feel free to use it in your cabin or cottage or the home in your utility room or whereever you see fit. It's thats verstile! The options are infinite with this unique vacuum system. The GarageVac features a unique 40 foot (that's right I said 40 FEET!) stretch hose that shrinks to a meer 8 feet for easy storage. It also comes with a non-corrosive adjustable one-piece wand, various brushes to tackle any job, bare floor tools, and (something I thought was great) an elongated dust brush that'll clean the dashboard in your car in one easy swipe. The system comes standard with HEPA filtration so no dust or allergens are ever exhausted back into the garage. Each bag holds an incredible 1-gallon of dirt and is the easier to change than a pair of socks. Just push up the latch and remove the door with your bag still attached. No dust to fly up in your face like when you're emptying your central vacuum canister. It weights practically nothing compared to other vacuum systems. At just 9 pounds and 4 inches deep, GarageVac is the most compact and lightweight central vacuum cleaner on the market. When it comes to a garage vacuum system it must be simple, compact and easy to use. If it wasn't why would you waste you time on any other system. The GarageVac is American made and features an industry leading 6(six) year warranty. This truely a system that you'll want in your garage for any job you have. With all the calls we get about garage systems, here is your answer to it all. Thanks to InterVac for this revolutionary design system. edit: The GarageVac system is now live on our website! Click here to check it out! The deal is done. The I’s are dotted and the T’s are crossed. 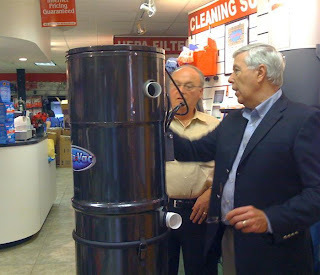 Two giants in the industry have merged to introduce the most state-of-the-art central vacuum system to date. The Cana-Vac central vacuum company, one of the most prestigious - if not the top - central vacuum company in the world and Thinkvacuums.com have teamed up to bring you this new system. The President of Cana-Vac, Mr. and Mrs. David Lawrence, along with their son, Andrew, and the US representative, Marty Laska were kind enough to fly down from Canada. They approached us with a new premier line that took years to develop, and they chose us to be the only company on the internet to carry their new Cana-Vac hybrid line, designed by retired NASA engineer Leonard Budd. By using space age materials and state-of-the-art motors, these are innovations that will become a new trend in the industry. We've been lucky enough to be selected out of all the other companies on the internet to represent their premium line of central vacuums. It's so top secret that the other 28 central vacuum companies out there will be simply envious of this new technologically advanced system and wonder why they didn't think of it first. Cana-Vac doesn't just sell their products to just any person who jumps on the internet. They choose who they want to do business with, and thankfully we are at the top of that list. We truly didn’t know we were chosen till the last minute to exclusively introduce the next generation of central vacuum to the industry. The new line is more energy efficient, more powerful, and offers better filtration. “More Bang for your Buck”. These new units will start from just $429 to the top-of-the-line $799 which has 808 airwatts. A unit with that many airwatts typically retails for over $949! An unbelieveable price for unbelieveable power. The first 250 customers ordering this unit will also receive a free car & garage kit (while supplies last)! That in itself is a suggested retail value of $100, completely free. This promotion is yet another exclusive to Thinkvacuums customers only! We believe that in this economy, the best buy is the best value for your dollar and this is an excellent bundle. These new units feature the new ESP (Extra Suction Power) Ametek-Lamb motors, which were designed particularly for this central vacuum. Best of all, their warranties are the real deal. Virtually covering the whole system for 35 years motor/Lifetime on the entire vacuum unit. That’s twice or 3 times longer than the average central vacuum system offered on the market. Another first in the industry brought to you by Cana-Vac. Our esteemed guests brought with them the new hybrid prototype of the system to demo it for us as well as the other mid-range sytems for us to pick and choose. They are looking to us to provide them with feedback on these new systems. During a dinner with the whole Cana-Vac crew, David gave us the highest praises for being the company we are, with the excellent customer service we provide it's no wonder that we were the only ones chosen to take on this new line. We were so honored to have such a prestigious system brought to our doorstep. We are both excited about this joint venture. So many years of being in the central vacuum field, we've witnessed this industry evolve into what it is today. So many companies are adding "bells and whistles" like LED screens to simply monitor the temperature, it’s just a waste of energy. While nice, bells and whistles are just a waste of resources and use more electricity. This is a REAL innovative technological achievement in the central vacuum industry. We look forward to having these excellent new vacuums live on our website very soon, so you can see for yourself how great these units are. If you just can't wait to get your hands on one of these great units, give us a call! We'll be happy to take a pre-order and ship it out the day we get our stock in, which should be on Tuesday, March 24th. 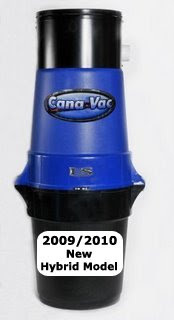 You can also check out our Cana-Vac vacuum page on our website which will be updated when they arrive. Can't find a good central vacuum installer? Tired of unreliable handymen? Why stress any longer? We're proud to announce an absolutely free installation referral program. This is a truly unbelievable service for customers and builders alike. Through our vast network of electrical supply companies, manufacturers, and trained certified technicians, we are able to provide you with a local solution for your central vacuum installation needs. We don't just open a local Yellow Pages book and suggest somebody for you to go to in your area, we have partners all over the United States with over 1,050 certified installers that will help you get your central vacuum system running. We are with you through the whole process, from that first initial phone call, advising you on the best system that will provide you with many years of happy vacuuming. At the end of the installation, we'll follow up with a with you on how your system is working out and how the installation went. We strive to provide our customers with innovative services that our competition only wished they thought of first. When you're the best, everyone just strives to be like you - it's a "monkey see, monkey do" world. The only difference is they don't have the sizable and experienced network like we do. Let us do the work for you: call us any time at 1-800-322-2965.